The man had to be treated for irritation to his face after the spillage at Edinburgh's King's Buildings. 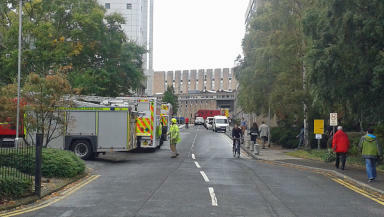 A student has been taken to hospital after a chemical incident at a university. Emergency services were called to the CH Waddington building at the King’s Buildings at the University of Edinburgh just after 11.30am on Thursday. A chemical had been spilled in a laboratory at the Centre for Systems Biology on Mayfield Road in Edinburgh. One man had to be taken to Edinburgh Royal Infirmary to be treated for irritation to his face. Firefighters went into the lab with specialist kits to clean up the spillage. A spokesman for University of Edinburgh said the injured man is a student who was conducting an experiment. "An incident took place at King's Buildings this morning when a student poured benzene bromide into a beaker which he thought was dry. As there was moisture in the beaker, the chemical reacted and splashed the student's face. "The student had followed all appropriate health and safety procedures and was wearing a lab coat and goggles. First aid was administered at the scene, and the student was then taken to hospital for treatment. No other staff or students were placed at risk."